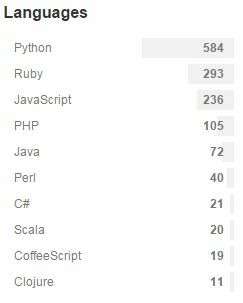 This 100 item list represents a search of github for “twitter-bot”, Apr 2015.
lukapusic/twitter-bot .. Linux, OS X tweet bot which uses cURL. yasulab/SimpleTwitterBot .. Gather tweets including ‘search_term’ on Twitter, and re-tweet it. This bot runs on Google App Engine. The following twitter account shows a sample bot run on Google App Engine. aproxacs/twitter-bot .. MSN bot that shows and updates with twitter timeline. peterwilliams97/twitter_bot .. A bot that offers sympathy to people who have suffered paper cuts. rfreebern/simple-twitter-bot .. A simple framework for creating node Twitter bots. dariusk/grunt-init-twitter-bot .. A grunt init template for making Twitter bots, preloaded with some useful libs. muffinista/chatterbot .. A straightforward ruby-based Twitter Bot Framework, using OAuth to authenticate. dariusk/examplebot .. A simple example Twitter bot using NodeJS. quile/twitter-bot .. Tiny little helper that facilitates writing standalone twitter bots in clojure. coreyhaines/tweetbot .. Tweetbot makes writing twitter bots twivial! tbotqy/Twitter-Bot .. Some simple codes that interact with Twitter APIs for my use. c9dong/Twitter-Bot .. Robot that reads tweets and does actions accordingly. davidxia/twitter_bots .. Tweet automatically. Follow my bots. dariusk/metaphor-a-minute .. Metaphor a Minute! You too can write an annoying philosophy twitter bot. codeforamerica/CutePets .. Twitter bot that posts adoptable pets in your city. Narno/phptwitterbot .. A simple Twitter Bot written in PHP5, allowing to search and retweet things. dariusk/latourswag .. Bruno Latour + #swag = Twitter bot! henriquesa/twitter-bot .. A twitter bot for posting and retweeting statuses. miguelangelnieto/twitter-bot .. Twitter bot, retweet the hastag you want. Ruby. OTSTomcat/Twitter-Bot .. A bot that scrapes Twitter messages and posts them to IRC channels. phosphore/twitter-bot .. A skeleton to create a bot that replies when you mention it, easily customizable! mirakui/retrobot .. Retrobot is a twitter-bot engine which is working as mirakui_retro. samirketema/Twitter-Bot .. Twitter bot that searches for top 100 misspelled words and automatically corrects it in a sassy fashion. KartikKannapur/Twitter-Bot .. Twitter bots are computer programs that watch each public tweet on Twitter. When a bot finds a tweet with those keywords, it either sends a pre-written response or it follows your Twitter account.